Needless to say, I couldn’t wait to get home and jump right in. From the Back Cover: Kentucky: Dining by the Lakes provides and insider’s look at some of West Kentucky’s preferred dining establishments. Chefs and restaurant owners have generously opened their kitchens to provide easy to follow recipes for a sampling of their most popular creations. Reflecting the diversity of the local cuisine, Kentucky: Dining by the Lakes contains selections as down home as fried catfish and chess pie or as exotic as Entrecote au Poivre and Parfait au Grand Marnier…. The book was published in 1997, so some of the restaurants covered are actually no longer around. This makes the book EVEN more valuable, in my opinion, as we’re literally left with a taste from the past. A great example is the recipe for “Bill’s Coleslaw” from The Pelican. Not only does the book give a couple of WONDERFUL recipes for each restaurant covered, the reader is given fascinating mini-histories of each establishment. Country Cupboard Chess Pie and Fudge Pie! And lots more – including restaurants around the lakes as well as restaurants in Madisonville, Paducah, and Henderson. 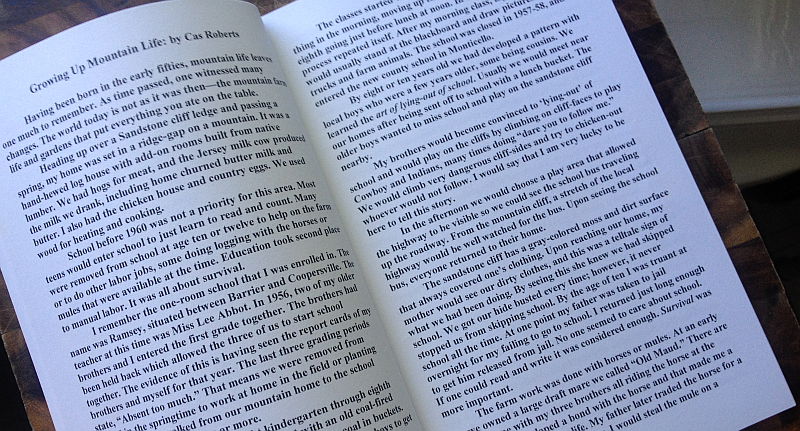 Many more surprises are waiting on each page – again, I just don’t want to give too much away. Part of the fun of Kentucky Dining By the Lakes are the surprises. 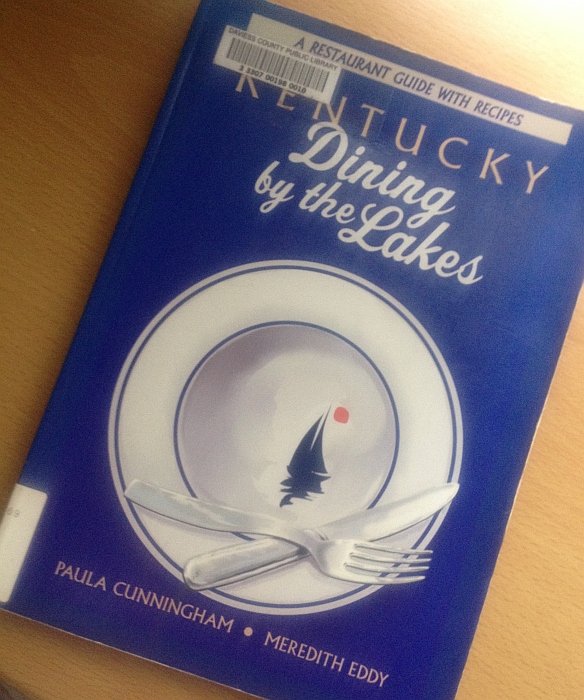 Kentucky: Dining by the Lakes is available on Amazon for pennies… and I do mean pennies. You can find used copies (which is exactly what you’d find in a library) for less than a dollar. I’m going to order a copy the minute I take my library book back. Not only do I want to add it to my collection of Kentucky books, I know I’ll use the recipes again and again. Click through one of the links for more information. You’ll love every single inch of this one. The most recent book I read that fell under the category of Kentucky History was As Country As It Gets: Short stories from Appalachia by Cas Roberts. 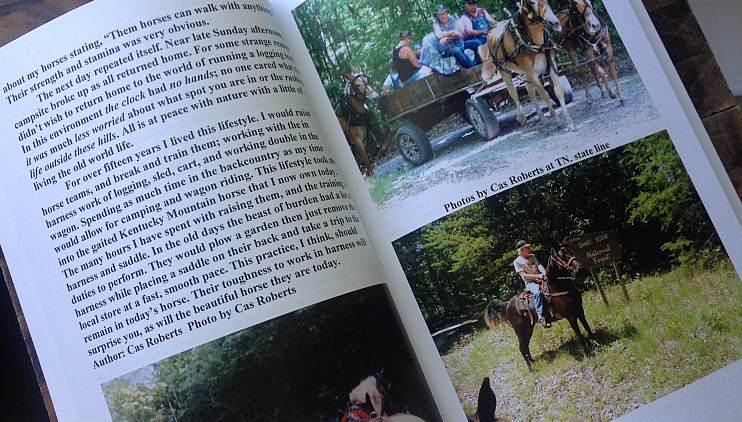 This wonderful “Genuinely Kentucky” book was sent to me a few months ago in exchange for telling y’all about it. I enjoyed it so much that it’s an absolute pleasure to do just that. As a genuine bookworm and book reviewer (on several of my blogs), I find that often what makes a book stand out to me is what it isn’t as much as what it is. Truth be told, this is usually the thing that separates an “okay” book from a “really good” book. If you’re going to write a mystery…. write a mystery. Leave the romance to others. If you’re going to write a book about photography… white about photography. Leave the political commentary to someone else. If you’re going to write a cookbook… write a cookbook. Don’t tell me what’s “ethical” for me to eat and what isn’t! You get the idea. As Country as It Gets is charmingly… well…. as country as it gets. Just as it should be. Review Continued Beneath the picture. I knew the book was on its way to me and like any good bookworm who is also obsessed with Kentucky history and culture… I watched my mailbox daily. I suppose I had a few pre-conceived concepts of what the book would be like, from the title alone. It lived up to my expectations beautifully and surpassed them once I began “visiting” with the author. I say “visiting” instead of reading because that’s the FEEL he has achieved with this book. 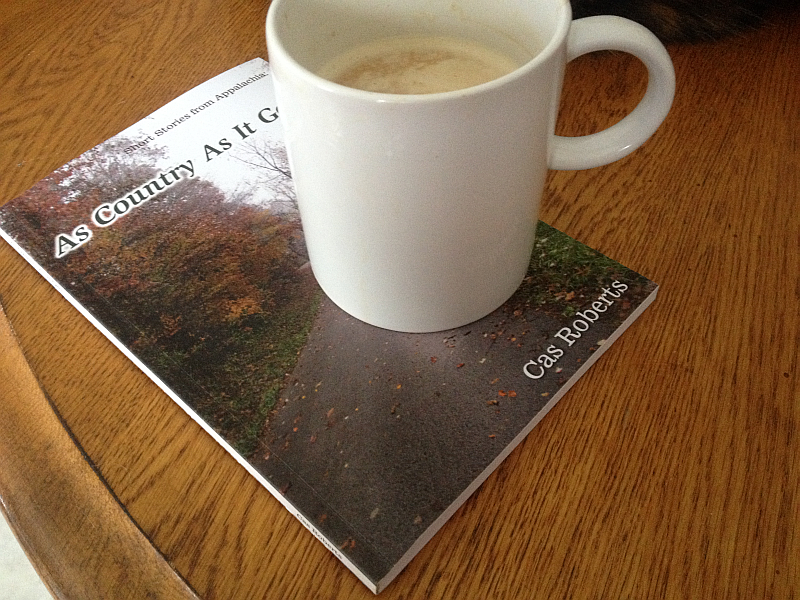 The reader has a feeling of sitting down with Cas over coffee and listening as he talks about growing up in a period of time most of us have only heard about from relatives. Gardens were where everything you ate came from. Most large families grew extra-large gardens to provide food for themselves. They canned vegetables all through the summer. Potatoes were hand-harvested, sometimes plowed out of the ground with a horse and a plow. I have picked up the potatoes in a bucket and carried them to a spot called a potato hill. This was a circle being hand made by mounding up dirt about a foot high in a circle. Straw was placed on the spot where the potatoes would be placed. With potatoes poured in the center it would raise as a pyramid. Straw was used to cover the potatoes and dirt would be shoveled onto the straw. Then wood boards split with a fro and hammer from a Chestnut Oak tree would be used as a single layer standing upright to cover the mound. This did prevent the rain from getting them wet and stopping the freeze during cold spells in wintertime…..
We’re drawn in as he talks about ginseng hunting, moonshining, mule logging, and other “real life” adventures we’ve only seen played out on television. Several parts made me laugh out loud – especially a section where he talks about “going into town.” Apparently a favorite source of entertainment for young boys at the time was as simple as it was free…. fighting! They’d literally look around for another boy who was also looking for a fight. Then they’d have at it! His story reminds me so much of many my husband has told about his childhood. Michael grew up in another part of Kentucky, and during a later time, but fighting was still a favorite pastime apparently. As I said, As Country as it Gets is everything it should be and nothing it shouldn’t be. It’s warm, wonderful, charming, and a total eye-opener. It’s not long before you realize why many people (our generation and older) are so concerned for today’s youth. There are exceptions, but kids today don’t work as hard as kids yesterday. They also don’t learn the strong love of and respect for nature… unless, that is, we expose them to it and instill it into them. Whether you’re a proud Kentuckian, like me, who can never get enough of Kentucky history, stories, and culture or you’re new to Kentucky and are looking for wonderful insight into what makes its people “tick,” As Country as it Gets is the next book you should read. I actually put off writing about this particular book a few weeks for one reason only – I hope many of you will buy one as a Mother’s Day or Father’s Day gift for your loved ones. I KNOW these stories would be such a beautiful thing for Kentuckians to read. And relive. 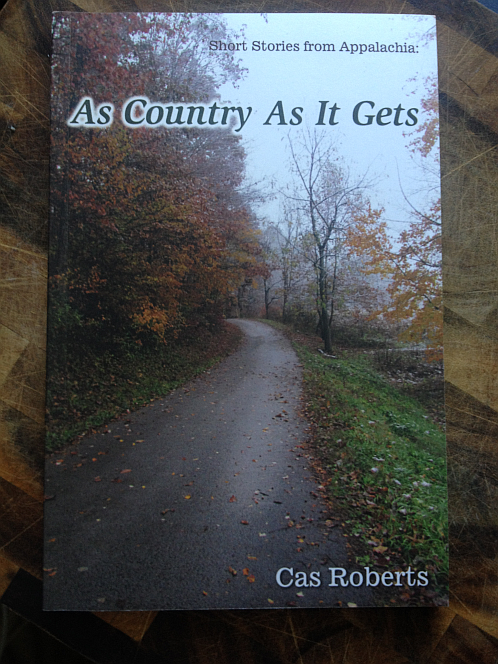 You can find As Country As It Gets: Short stories from Appalachia on Amazon. You might want to buy several copies – I know you’ll want to add one to your library as well as giving one as a gift. I want to have more visits with Cas Roberts! I know he has more stories in him – I only hope he chooses to share them with us.